Las Vegas, the Disney Land for adults, is a place where alcohol, gambling, and shows (of many types) are waiting to welcome you. Las Vegas is also a city I’ve never been to, because I don’t drink, gamble, or go to the “shows” the city is famous for. But there is much more to Las Vegas than what I described above. For starters, there’s the SEMA show, which is the world’s largest aftermarket car/car parts show, there are also hundreds of other shows/conventions like this in Vegas, like the Star Trek Convention, Comic Con, and many more. There are also many non-vice shows that the whole family can see, shows like Cirque du Soleil, concerts, magic shows etc. When I was invited to take part in the Trail Trek Tour, I jumped at the chance to visit the fabulous Las Vegas. I’ve already written about our daytime adventures on the Trail Trek Tour here and here. This post is about the times when we weren’t checking out tuned cars or getting dirty on the Wheeler Pass off-road trail. One of the main sponsors of the Trail Trek Tour was MGM Resorts, who provided our hotel accommodations, took us to various restaurants, and the Michael Jackson One show. 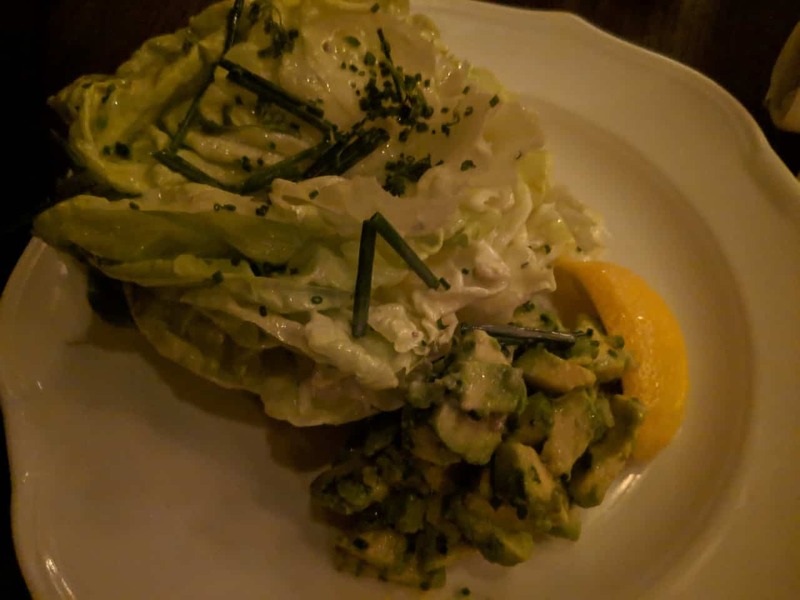 We stayed at MGM Resorts’ newest property, the Park MGM. 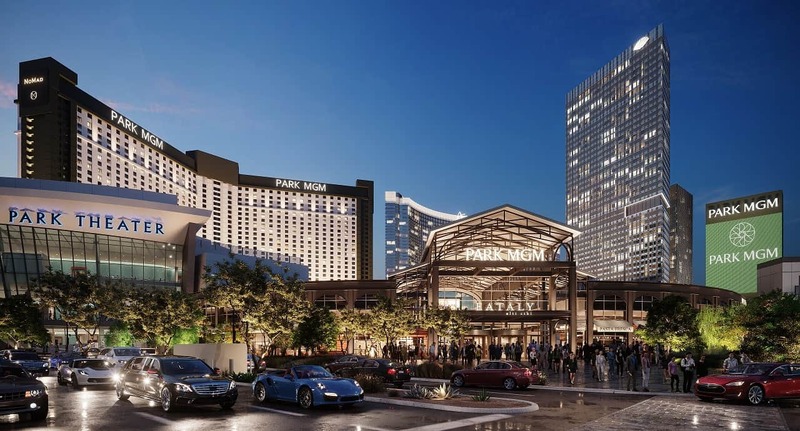 Park MGM was formerly the Monte Carlo, after extensive renovations, Park MGM was born. 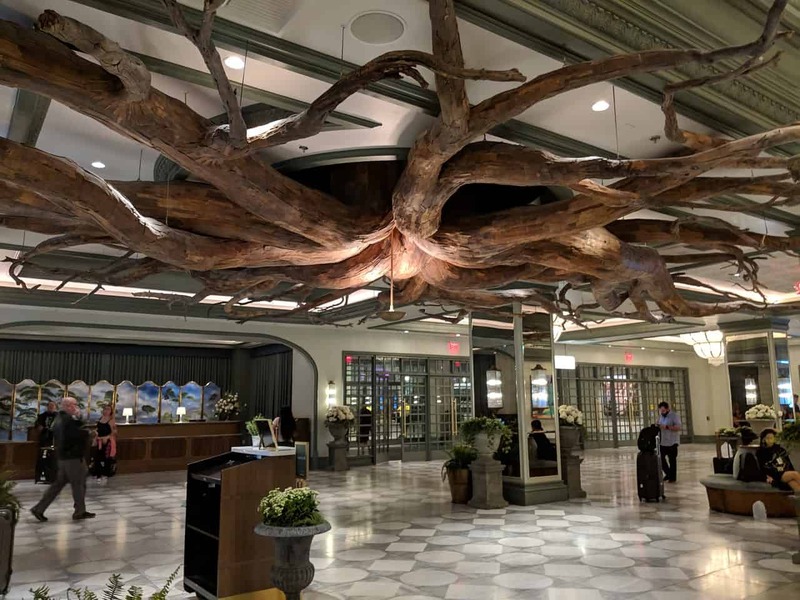 Upon entering the lobby, you’re greeted by a wide open space with shops on the sides, reminding me of a high end mall, a huge tree trunk with branches attached to the ceiling, and a self-check-in. Self-check-in, or self-serve, is becoming more and more common nowadays; you’re checking out your own groceries at the supermarket, checking yourself in at the airport, so why not check yourself in at a hotel? To me, checking in/out at the airport and supermarket is not a big deal, as those services are not very personal, and I just want to get it over and done with as soon as possible. But checking in at a hotel needs a bit of a personal touch, at least for me, where an actual human being welcomes you to the hotel, tells you where the cool spots are, if you’ve never been to that particular place in the world, which areas to avoid etc. ; which kind of makes you feel just a little special. You won’t get that with self-check-in. Other than this minor complaint, which is probably not even a big deal for most people, our stay at Park MGM was excellent. 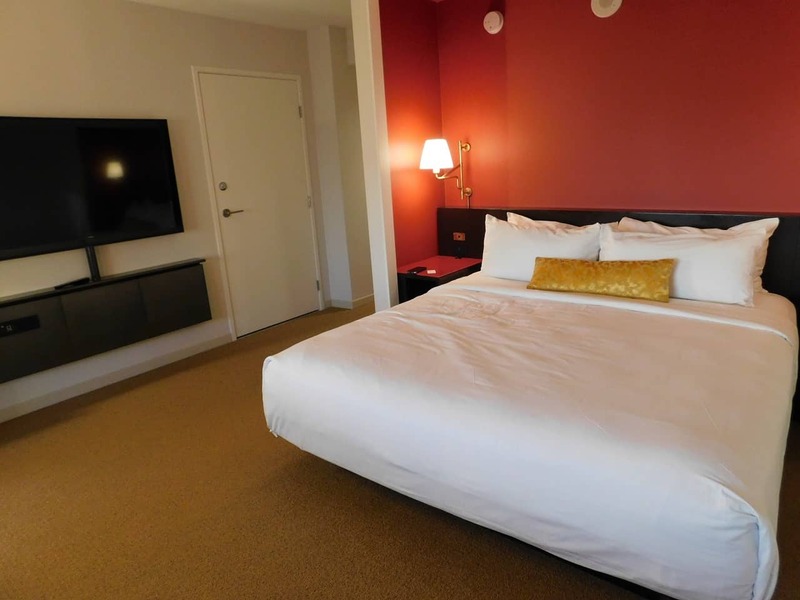 Park MGM rooms are designed to give you a feeling of home, with rooms in either white/green or white/red. 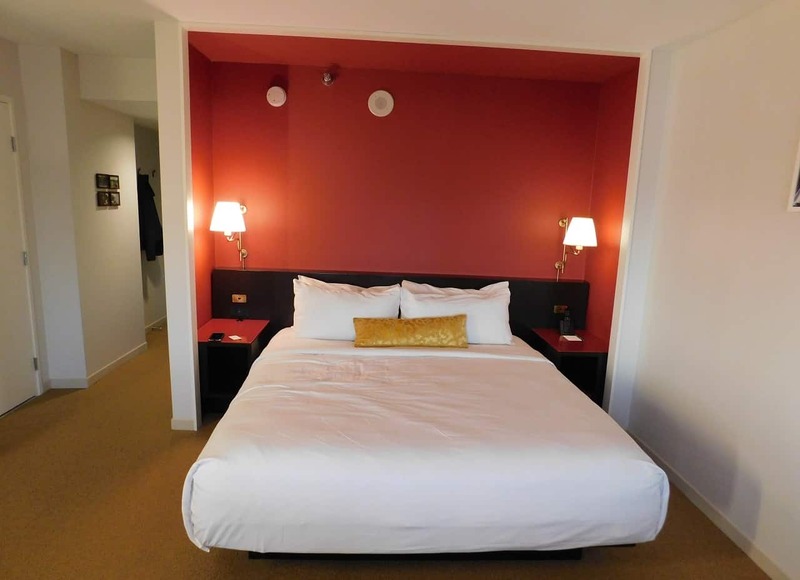 My room was located on the 16th floor and had the white/red décor. You’d think the red would be overpowering, but it felt very homely. 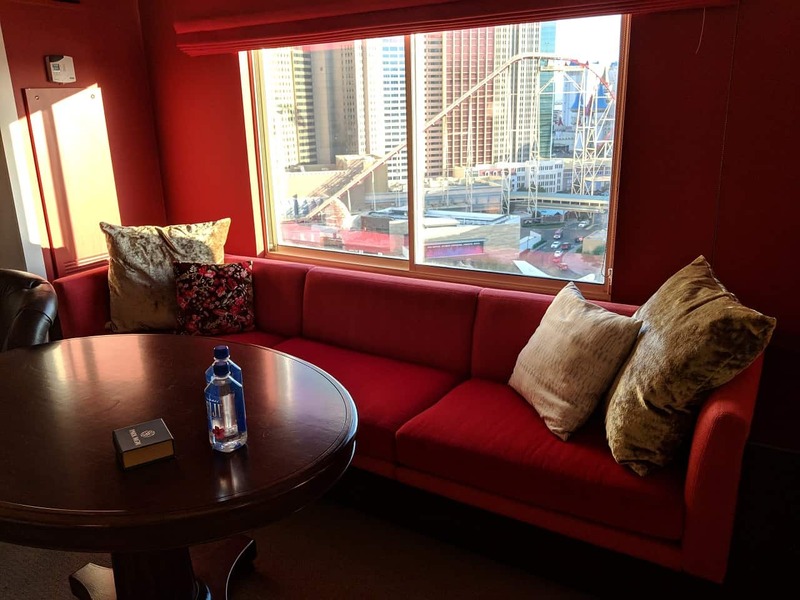 The room was quite large with a king size bed, and a three-person couch and a leather seat, with a small table; a good place to spend some time with friends after a long day (or night) of seeing what Vegas has to offer. 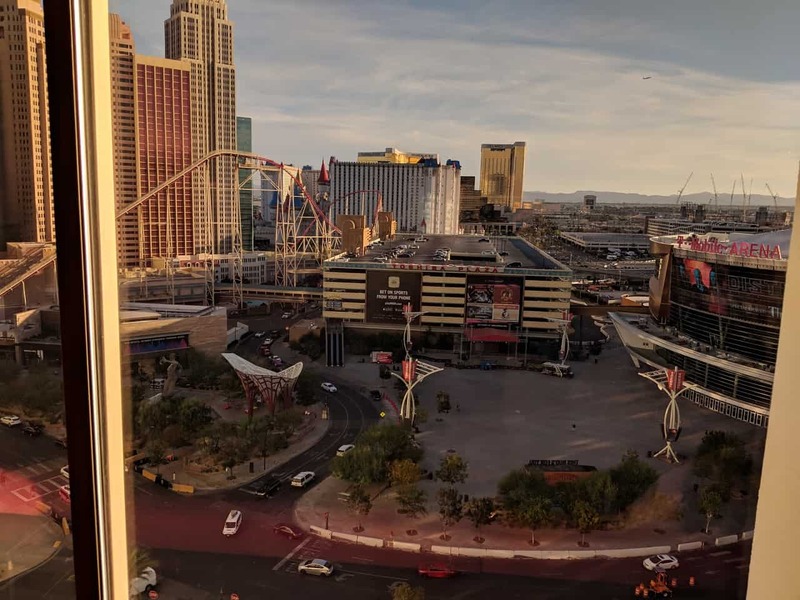 I had a good view outside the large window, looking towards the south with front row seats to the T-Mobile arena, the roller coaster, outdoor entertainment center, and the distant mountains. The bathroom was also a standard size, not too big, not too small. The same white/red theme continued here, it was clean and well-stocked with lots of towels. 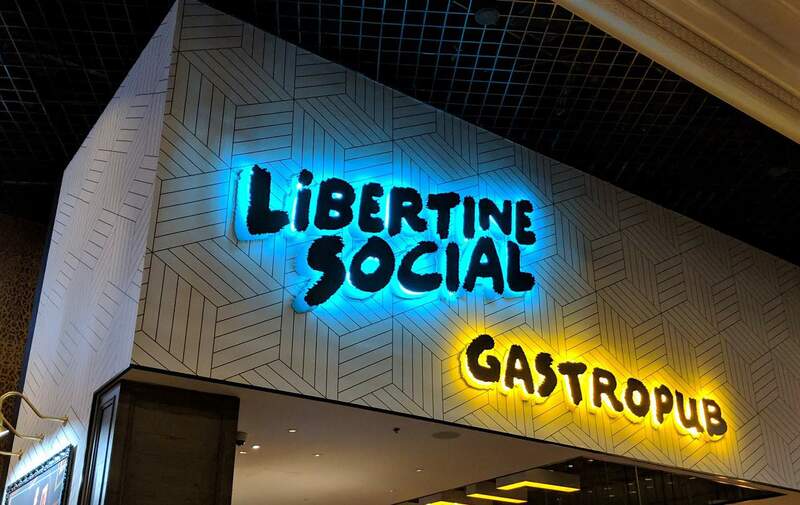 The night of our arrival in Las Vegas, we were invited to dinner at Libertine Social gastropub in Mandalay Bay Resort. 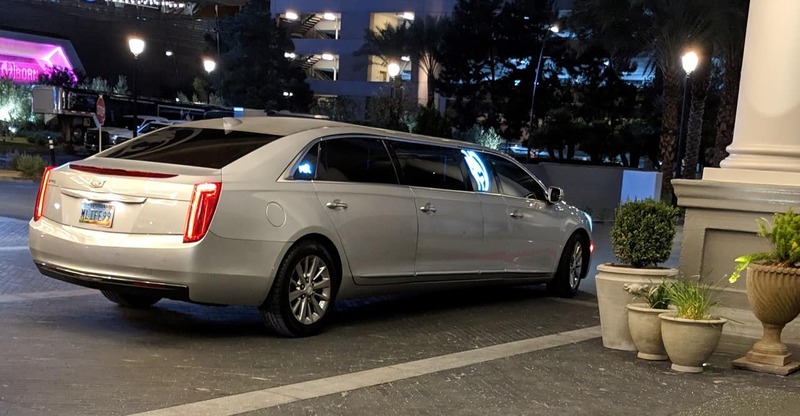 In typical Las Vegas VIP-style, MGM Resorts provided us with a ride in a limousine to the venue, very cool and “baller”. Libertine Social is an amazing place to eat, the décor alone will take many hours to check out, with walls full of posters, guitars, and funky lights. 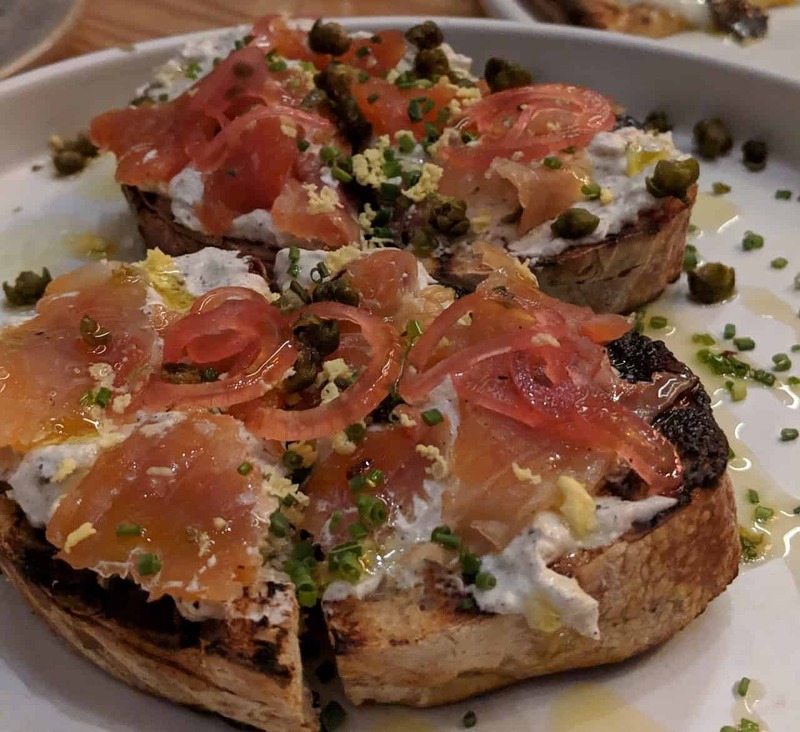 The chef at Libertine Social is James Beard Award-winner Shawn McClain, who prepares some amazing American bar food with a modern twist. 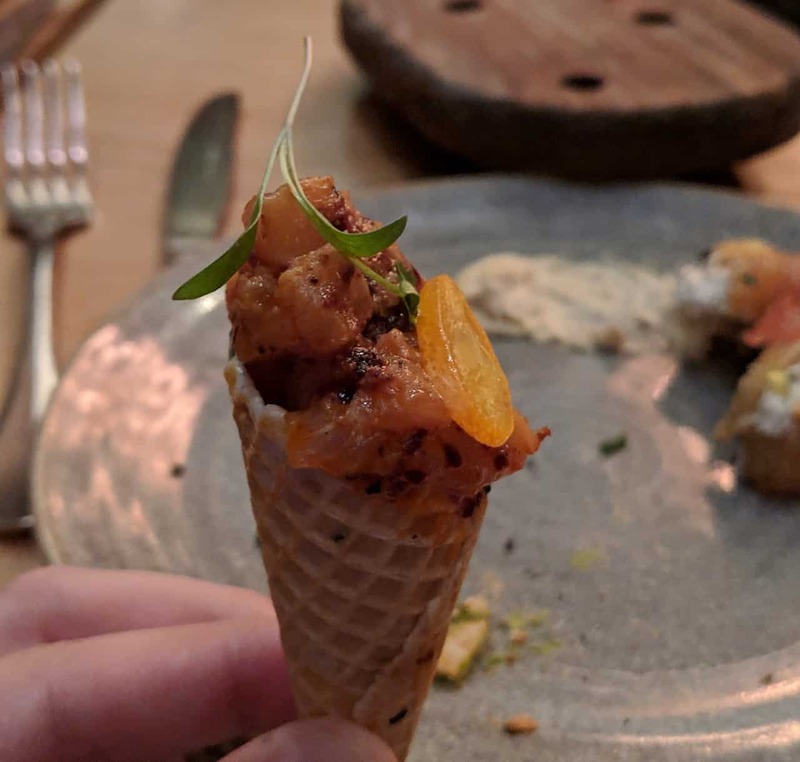 For our Trail Trek group, the chef kept sending out one amazing dish after another, it seemed to never end, have a look at the phots below and try not to drool. After dinner, we went to the Michael Jackson One show, which is also in Mandalay Bay Resort. The show was amazing, with acrobatics “Cirque” is famous for and music by the King of Pop. We weren’t allowed to take pictures during the show, which is understandable, but believe me, it was a treat, especially if you are a big fan of Michael Jackson. Have a look at the promotional video below, it will make you want to visit Vegas. 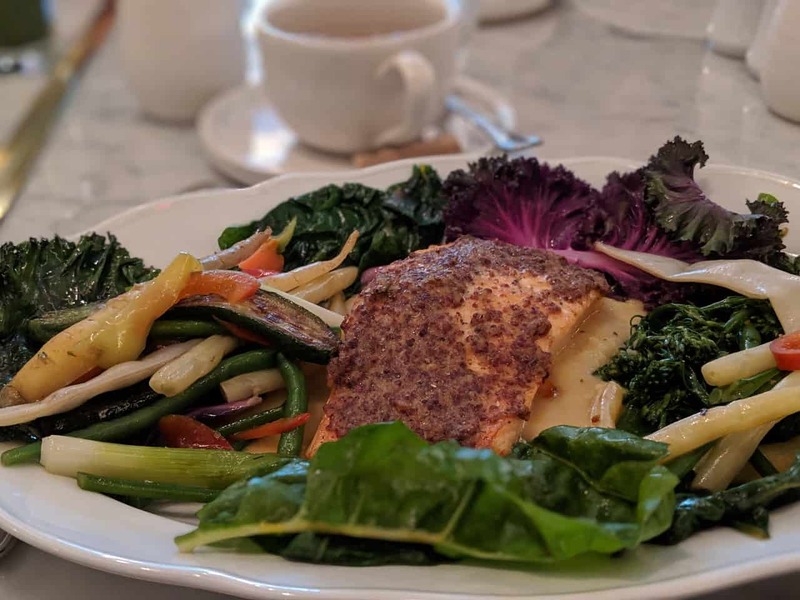 Primrose is located in the lobby of Park MGM hotel and is a great place to start (or end) your day. Before we headed to SEMA, we had breakfast at this charming restaurant; it is modeled after a country home. 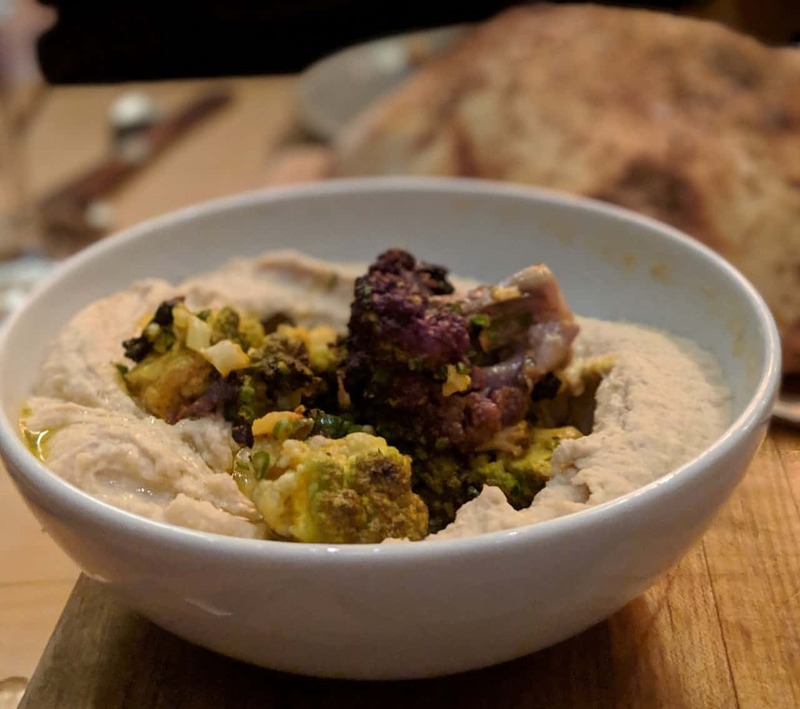 The menu has a good selection of foods ranging from breakfast to dinner items, and of course drinks of all kinds. For my main meal, I ordered a “King Salmon”, which had amazing flavors, the plate also came with lots of veggies to go with the protein. The portion was large enough to keep me going strong until lunch, which was many hours and thousands of footsteps later. 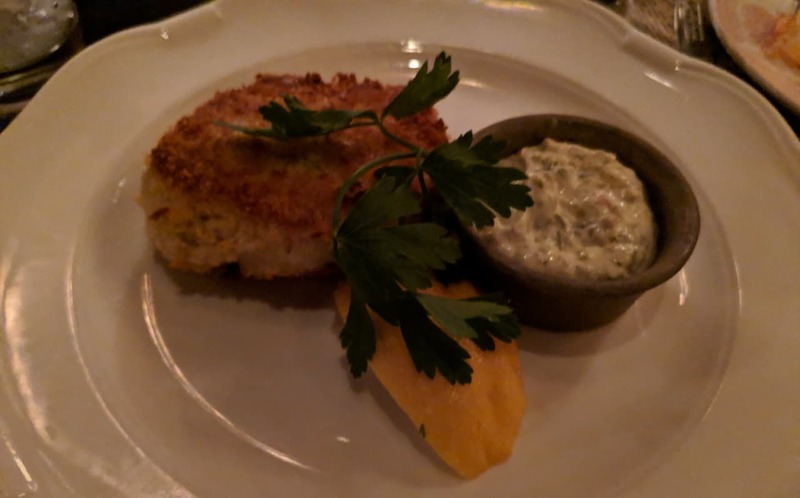 On day three of our trip, we were treated to another amazing dinner, at Bavette’s Steakhouse, located at the casino level in Park MGM. 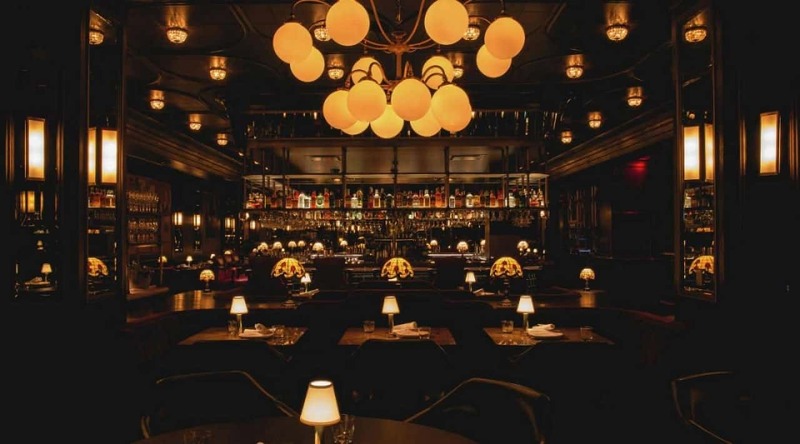 The restaurant is decorated in speakeasy style and is nothing like the rest of Vegas; it’s quiet, dark, and very classy, my type of place. The chef sent out more food than we could eat, it was all amazing. 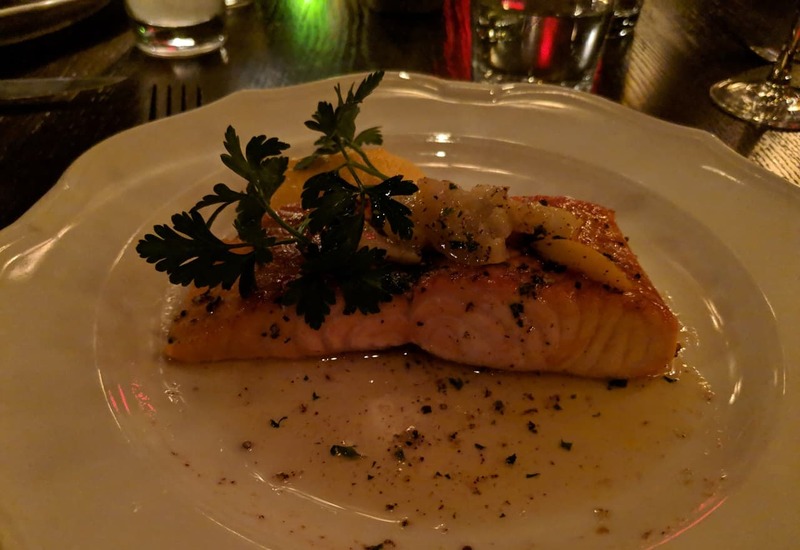 For the main course, I had a Broiled Salmon … because getting a salmon at a steakhouse is a normal thing to do 😉. The salmon was great, along with all the appetizers and salads. 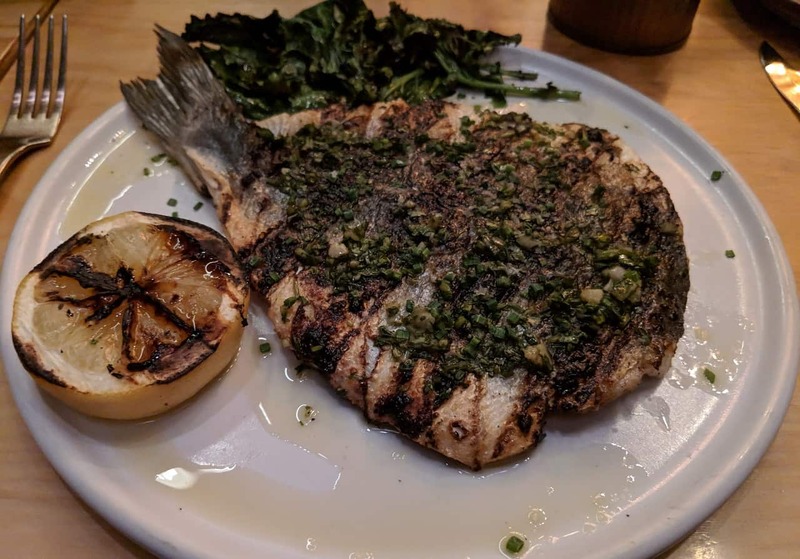 I enjoyed the food, the atmosphere, and the company. I would like to thank Phil from Trail Trek Tour and Park MGM (and MGM Resorts) for hosting us at their various venues. It was a great trip and my entire experience was very positive, it was my first visit to Las Vegas, thanks to MGM Resorts, it was a very memorable one.